Technical Pro’s VMPR speaker series consists of different sizes and power outputs all put together in a set of the most durable and long lasting speaker design’s on the market. If you are a studio designer, setting up sound for a live stage or venue you will find what you need in this series of speakers. Depending on your venue size and needs you may go for the smaller or larger offering, each built with the same innovative technology that is expected from Technical Pro. The VMPR15 is the king of the series, meant for large sized venues, and meant to push out a HUGE SOUND! And the signature RED frame on the woofer makes it easy to identify. The VMPR15 is a 15'' Seven way Carpeted Cabinet Speaker w/ Steel Grill constructed with a durable and long lasting design. 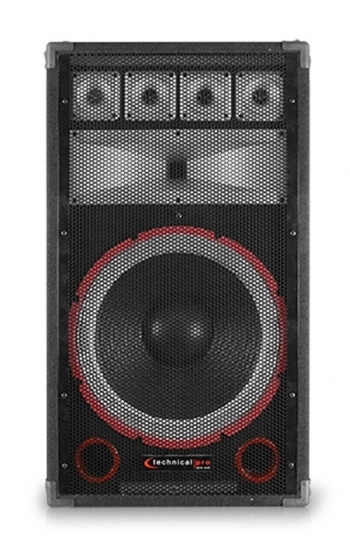 This speaker is meant for very large venues or stages. The power and sound output of these speakers are huge! This is meant for the studio professional or sound designer that is looking to set up a professional speaker system on large scale. (Be sure to check out the rest of the VMPR series for all your needs!). The VMPR15 can push out a total peak power of 1500 watts. This is the type of power you need to satisfy any crowd or audience. The inputs are 1/4” and bare speaker wire. Connect any standard amplifier and you are all set up! The components inside consist of 4 Piezo Tweeters, 1 15'' woofer with a 2.5'' voice coil and 60 oz. magnet, and 1 5'' x 15'' horn with a 1.5” voice coil and a 25oz. magnet. The two side panel passive radiator do an incredible job adding to the power. The frequency throw from this combination of speaker components will be a full spectrum, achieving crystal clear highs and booming lows! Everything about this loudspeaker is massive! The VMPR15 is constructed with Technical Pro’s built-to-last technology. The sturdy design will keep your speaker components safe and sound in the most rugged environments. This speaker can be stacked or mounted using the single pole mount. Easily move and position this speaker by using the built in carrying handles. The front panel of the speaker is outfitted with a full length perforated steel cage. This will keep your speaker safe in the most rugged environments. In addition the corners are reinforced for extra protection! If are concerned about the durability of your speaker and insist on a design that will not fail, you’ve found your answer! The VMPR15 is a great choice for a loudspeaker that can push out a massive sound, and at a cost that is very much affordable! The heart of the VMPR series lies in its unique combination of premium construction quality along with features and performance technology previously unheard of at this price level, offering a range of options without equal. With improved performance and great looks, they deliver punchy mids and smooth highs at any level, with a bone crushing low-end. The quality wood cabinetry construction is carpet-covered and has an extra heavy-duty metal grill for ruggedness.